When considering the requirements of the Rothman Award and the qualities that represent it, one name has to come to mind. 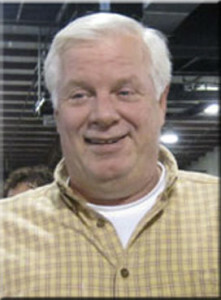 An exhibitor who enters and attends nearly every Midwest Region show, who serves the region in many different ways, including show production and a prominent position in their clubs, and is always a pleasure to see, ready with a smile and to answer questions in a positive way – all while exhibiting good sportsmanship. It’s truly a hard award to live up to, but the Region is fortunate to have this year’s winner as their own. 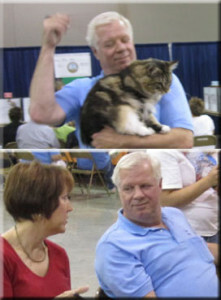 John Bierrie, working with his wife Terry, is the owner of B Street Cattery, but the cats really run the show. Not only active in several clubs and shows, John has gone the extra mile of representing CFA on a National Level with the Breeders’ Assistance Program and the national food bank. He has almost single handedly revived a club that was resigning and made it into one of the Region’s most successful, and profitable, shows. And he entertains the Region with his On The Road Again presentations. John is open minded about any idea that he feels might help CFA, the fancy and always, the Midwest Region. With his positive attitude, his incredible sportsmanship, and his love of cats and this Region, John is one of the most respected people we are fortunate to have in the Midwest. His service with BAP and the food bank are truly exemplary; John is the type to give you his last dime and his shirt off his back if he believes it can help. 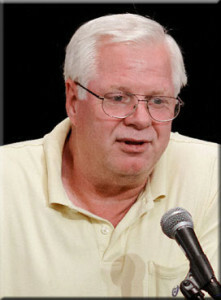 The Midwest Region and CFA are both fortunate to have him, and proud to name him the winner of the Rothman Award for 2012.